We had noticed that Amara Raja Batteries Ltd. is a common multibagger from repuded analysts. We are publishing our Value/Growth aspect based view on the stock. Considering the above aspects we declare Amara Raja Batteries Ltd. as a potential multibagger. Considering the large cap capitalization, A group, reputation we can invest up to 10% in the stock. 5%, 3%, 2% break up investment advised. Welcome Back! Here we are analyzing the scope of Accelya Kale Solutions Ltd. as a Multibagger. About: Accelya Kale Solutions Limited is part of the Accelya Group, a leading solutions provider to the Airline and Travel industry. Formerly known as Kale Consultants Limited, the company became part of the Accelya Group in 2011. As part of the Accelya Group, we help over 200 airline customers streamline their financial processes. We also help them gain insights on business performance using decision support tools and data analytics. Durable Competitive Advantage Company is a leader in Airline and Travel industry with a growing product portfolio. The increasing sales & profit every quarters is a visible evidence of it’s durable competitive advantage. Future Growth Drivers The airline industry is expected to grow further, but major hindrance is fuel price. The company is involved in cost optimization products & should not severely affect with the industry problems. Conservative Debt (long term debt < 3 Net Profit) Company have short term liabilities equivalent to current net profit, so pass. Return on Equity must be Above Average We recommend 15% ROE, the company shown around 26% ROE, so definite pass. Low CAPEX required to maintain current operations Company is with Low CAPEX. Management is holding / buying the stock Promoters are increasing the holdings. Stock Price is consolidating Not really, it is a high move up stock. PE, PB Ratio Current PE Ratio is around 10 & the latest result should induce 30% reduction in PE Ratio. PB Ratio is 3 times zoomed, but okay with such growth scrips. Cash Flow Positive Net Cash Flow is negative due to Investing & Financing activities. Paying Dividends, Tax Yes. Dividend Yield is around 5% which is very good. EPS Growth Rate 100%! 100% is the growth rate & for such an emerging brand it is really excellent one. Expected Gain in 10 Years Taking average EPS Growth as 50%, expected PE Peak after 10 year as 20, there exists chances to double the price every 3 years. We can calculate around 15-20 times returns in 10 years. Power of Brand Branding attracts more sales, more profit margins! Company is building a brand & should emerge as a top player within 10 years. Considering the above quality aspects we would like to declare Accelya Kale Solutions Ltd. as a Multibagger. For the total stock capital, we recommend 5% allocation around current price range & increase by 2.5% on 30% down cases. In this article we would like to evaluate the Multibagger Potential of Can Fin Homes Ltd. The primary attraction is this Branded Institution is quoting below Book Value. About: CFHL was promoted in 1987, the "International Year for Shelter for the Homeless" by Canara Bank in association with reputed financial institutions including HDFC and UTI. Now NHB is also an important equity holder in CFHL. Durable Competitive Advantage Company provides attractive interest rates, but bigger player exists in the arena, the solid growth in housing loans remains the core potential for our company. The recent management restructuring had paved 30% growth in EPS compared with the 10% growth for past 10 years. Future Growth Drivers India’s home loan market is growing in rate of 30%. Conservative Debt (long term debt < 3 Net Profit) No. The total liabilities is around 300 crores & latest Net Profit is 55 crores, so the formula does not match. But eventually Banks & Financing companies have high debt ratios. Return on Equity must be Above Average Company is providing ROE around 14%, which is slightly lower than our 15% expectation. Management is holding / buying the stock Yes. Promoter holding is around 40%. Price is Under Valued (< intrinsic value) Stock is quoting 30% discount to Book Value. Stock Price is consolidating Almost consolidating with down from 52wh. PE, PB Ratio PE around 5, PB around 0.7 which are really attractive. Cash Flow Positive Negative Net Cash Flow, but Operating Cash Flow is positive. EPS Growth Rate 10% to 20%, but the Trailing year should show higher rates. Expected Gain in 10 Years Considering EPS growth around 20%, the stock price should double every 4-5 years. For a 10 year period this could yield 4 times returns & a PE Peak around 12 should yield total of 8-10 times returns. Power of Brand Branding attracts more sales, more profit margins! Company have the trust & fame of CANARA BANK! Corporate Governance, Reputation of Leaders Company consistently behave well on corporate governance norms. The current past year results are yet to declare, it shown above 30% growth in Net Profit & yield higher EPS resulting in lower PE. We expect the new PE Ratio around 3-4. Considering the under-valuation, growth rate, brand name, we declare Can Fin Homes as a potential multibagger. Although it is a B Group stock, but being large cap we recommend the regular 5-10% allocation of your total yearly stock corpus. Futurecaps recommends 20 to 25 multibaggers per year, We expect a 25% to 50% allocation of your savings in equity. The stocks recommended here are gone through Analysts of several years experience in stock market. Although they were successful in predicting future multibaggers, the overall stock market is a risky game. Filtering quality stocks from the total of 4000 companies should reduce the total risks. The past performance of the company might not sustain in future, but through proper diversification we are sure about multibagger-returns in the total portfolio. We recommend the reader to put his/her own thoughts, invest wisely taking responsibility by themselves. In this post we would like to analyze Narmada Gelatines Ltd. a small cap company as a potential multibagger. About: Narmada Gelatines Ltd. (Erstwhile Shaw Wallace Gelatines Ltd) was set up in 1961. The company is strategically located in the Central Indian State of Madhya Pradesh and has convenient access to its main and essential inputs of crushed bones, acid, lime and good quality water. Narmada Gelatines Ltd., has pioneered the manufacture of ossein and gelatin in India and is today a frontrunner in India’s Gelatine Industry meeting exacting standards of various users worldwide. Let us analyze the traditional style of check list. Durable Competitive Advantage Company is into Gelatines business which is dominating in domestic market. The company should be able to sustain future competitions & growth in future. Future Growth Drivers Company is showing steady increase in Sales & Profits, but an average growth. Conservative Debt (long term debt < 3 Net Profit) Total Liabilities of the company is around 26 crores. The latest Net Profit is 15 Cores & hence less than 3 times of Net Profit. The company can easily close the liabilities in 2 years. Return on Equity must be Above Average ROE latest is 18%, which is above our average of 15%. Low CAPEX required to maintain current operations Not so attractive. Management is holding / buying the stock Promoter Holding is around 75%, which shows a good confidence from them in the company. Price is Under Valued (< intrinsic value) Considering the growth aspects Intrinsic Value is higher than current market price, plus the company is trading below book value. PE, PB Ratio Current PE Ratio is 3.4, but the trailing PE would be around 2. PB Ratio is already 50% discount & attractive so. Paying Dividends, Tax Dividend Yield is around 3.5% which is attractive. EPS Growth Rate EPS Growth Rate is positive ranging from 10% to 30%. Expected Gain in 10 Years Considering 20% growth, power of compounding, recognition as mid cap, we can say, the price should double every 3 to 4 years. So 10 times growth in price we can expect. Power of Brand Company was set up in 1961, Member of Jumbo Group which is into Restaurant businesses. Corporate Governance, Reputation of Leaders Overall seems to be good. Futurecaps thinks the company has multibagger properties. As the company is small cap & not a very aggressive player, we prefer only 1/3 of normal allocation. Understanding Properties of Money is Important! “A Professional understands all aspects of the Job” This is the core mantra of all successful leaders. They do not jump into situations without doing a proper learning. They won’t waste time in non-fruitful activities. Together with a leader can impose high growth’s to our life. When talking about ‘Money’, i feel that the people dealing with it are not aware the ‘Properties’ of it. Let us analyze the properties here..
Of course, we all know it & it is the reason we are working for fetching Money, as it is Valuable in the market. Money is a devised (created) mechanism for better functioning of economy. The older form of Money was barter system. No one can deny “Money” in this materialistic world. It was possible in the Jungle Era, but we are no long there. The comparison with ‘Oxygen’ means, we cannot live without Oxygen, similarly we cannot live without Money. Although, some people will say “They don’t care about money”, they are actually worried about it. Believe me, without having inherited family properties & passive income, we are under open risk. Imagine if you wanted to store food for your life remaining. You cannot store food for that much huge time. But you can convert the food items into Money equivalent & store it. Through proper investment, we can grow our money. This idea conveys our principle of “Placing extra Money” in long term, short term & liquid investments. The Investment Vehicle we use, will determine the Growth of Money. As the like attracts like, Money will attract more Money. So it is important that you have to have enough money to make it more. For example: an ordinary software engineer with 50 thousand salary cannot invest on an apartment with EMI of 25 thousand. He will fear of going job-less. The reason is he is not having enough money to backup the investment. So it is wise to have enough liquid money to protect future investments & future growths. In the same sense, money can grow, money can also diminish it’s value. For example, if you store money as currency in your home locker, after end of year, the value will be 5% lost. This is due to Inflation. Similarly, if you park the money in a car, after 1 year the car will cost 20% lesser in value. In both the above cases, Money Value is Depleted. So it is advisable to keep only short-term money in liquid format & others in Appreciation Vehicles like recurring deposits, fixed deposits, real estate, stocks, bonds etc. You can think of your current job, the amount of hours spend, surely it is stealing your freedom. Many of us enjoy the work, but not all days are enjoyable. May be, we are required to work in different passion of our soul, but shortage of money restricts us to continue restricted.. But this is for only present tense, future could be different if we properly plan & invest. Attaining passive income (free income every month to carry out the expenses) will make us chase the passion @ life. Talking with the poor class people of society, i had a feeling that they equate money to happiness, they think the riches are happy as they have money. This makes them spend whatever money coming in to the entirety & feeling happiness. Surely this is a myth, i can show dozens of rich families having chaos situations. The poor people will remain poor until they realize that excess money should be used for investment. This excess money will protect them from future money shortage situations. Although there are rich people who are sorrow at heart, i believe through proper usage of ideas they can thin the air. For example, idle time can be converted to fun activities if they can spend money & buy events, celebrations, vacations etc. They can also avoid being with chaotic situations Or problematic people as money gives the freedom of move. There is a psychological connections saying that money is energy. It says, if we feel we have excess money the Universe will make it happen, similarly the shortage feeling about money will create disastrous situations. To an extend it is true, but i recommend good feeling & wise spending. Following are the ‘Myth’s’ created about Money, they are ‘Myths’ to the trained mind. Money is Evil This depends on the person who uses it. If an amateur uses extra money for boozing, spending on offensive activities in society, then surely Money is Evil. I believe we all are responsible persons to use the excess money for the good of us, society & world. I can readily give good examples like Bill Gates, Narayana Murthy, PNC Menon who used their wealth to help back the society. Additional note that companies, religions insist on saying “Do not focus on money” as having money in possession will make people move out of job, move out of church & thus they loose a skillful worker or paying devotee. So always try to see the other side of the situation, Is there anybody benefitting from your lack-of-money’? I am open for thoughts from your side.. In this post, we would like to screen Infotech Enterprises Ltd. as a potential multibagger. Infotech has 10,000+ associates across 36 global locations. We adopt a proactive approach to serve our clients with our best-in-class delivery centers in North America, Europe, Middle East and Asia Pacific. Our clients span multiple industries such as Aerospace, Consumer, Energy, Medical, Oil and Gas, Mining, Heavy Equipment, HiTech, Transportation, Telecom and Utilities and include 22 ‘Fortune 500’ and 27 ‘Global 500’ blue chip organizations. History of Consistently Increasing Sales, Earnings & Cash Flow Yes, Sales & Net Profit increasing 20% plus every year. Trailing year too expressed growth. Durable Competitive Advantage We believe the product portfolio & niche skills will enable this company to continue as a Profit Player. Future Growth Drivers Information Technology sector is expected to grow further in long term. Return on Equity must be Above Average Return on Equity is around 15%. Theoretically it should be above 20%. Low CAPEX required to maintain current operations CAPEX is around 20%. Management is holding / buying the stock Management is Holding the stocks, but only around 22%. This leaves room for concern, as our happy promoter holding percentage is above 50. Price is Under Valued (< intrinsic value) Considering the Growth, Intrinsic Value is many fold of current price. Stock Price is consolidating Stock is around 52 week low, but not seems to be in down trend. PE, PB Ratio PE is half of Industry PE, so good. Price is quoting just 30% above Book Value, so good. Cash Flow Positive Company is maintaining a Positive Net Cash Flow. EPS Growth Rate 20% to 30% EPS growth for past 3 years, Impressing! Expected Gain in 10 Years If the stock can maintain 30% growth rate every year, then in 3 years price should double, resulting in 8 times returns in 10 years. Company hold a Blue Chip shine during the time & can command high PE Ratio up to 20 (current is 8), so there is further 2x opportunity. So MAX GAIN expected is around 16 times. Power of Brand Branding attracts more sales, more profit margins! Our company is building a brand & quite possible to be a brand like Infosys, TCS in future. Considering the Performance, Value Factors we see Infotech Enterprises as a potential Multibagger. Investment Decision is your sole responsibility. 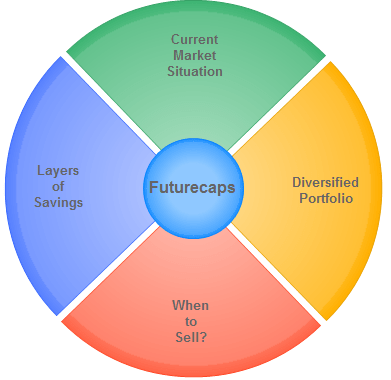 Futurecaps recommends proper diversification in your Portfolio. We have been receiving mails on "Is it right time for Investing”, “Market is on the Peak”, “Should i buy or sell” like & so. Surely, this denotes that, they have not understood our theories well. But i am happy that they admitted up front.. Asking is never a Crime, we encourage people to ask genuine questions. I would like to add the following points now. Market is closer to the Historical High of 21000. But fundamentally, the NIFTY PE Ratio is still 30% below the peak. Considering the overall economy & NIFTY PE Ratio, we believe market should not go Bear! There exists UPMOVE potential for Blue Chips, Mid Caps & Small Caps. But one should be cautious to see the VALUE PARAMETERS before investing in Blue Chips. You can accumulate undervalue scrips with huge growth potentials. I would like to iterate that there is no SINGLE INVESTOR in the world who made profit by holding JUST ONE STOCK! We can find thousands of companies in the stock market, if we invest in all, we are just waiting for luck.. But using fundamental analysis, we can find the TOP 100, going with more analysis we can filter further 10. Every year, buy 10 such stocks for long term. Through the quality iteration we are almost sure about Multiplying the investment. Here is the fact: For a 10 year investment in 10 stocks, 2 of them can give 20 times returns, 3 of them with 10 times returns, 4 with 5 times returns, 1 may go bankrupt. So on the average we can expect 10 times returns on 10 stocks invested with thorough analysis. We increase our chances through diversification, plus we decrease our risk through diversification. Peak of NIFTY PE Ratio: Smart Investors who use NIFY PE Ratio for investing, will accumulate stocks when NIFTY PE Ratio is less than 20, they sell all stocks when NIFTY PE RATIO grows above 25. Currently the NIFTY PE Ratio is around 18. One should note that CRASH of stock price due to temporary problems with companies are not SELL signals, but chances to accumulate more. We iterate that, if you are new to stock market, divide your savings into 3 layers. First one for real estate & preferably allocate 50% savings here. Rest 25% in stock market & 25% in Liquid Savings. The top liquid layer will always protect the underlying layer in case of emergencies.